Back along, in return for a product placement, I received a voucher from CSN to spend at their online store. It wasn’t for a particularly large amount, but I decided to treat myself to a couple of things that I would never normally buy. This set of cutters were one of the items I bought. Other than a standard set of three round cutters in varying sizes and a gingerbread man, I don’t have any fun ones suitable for biscuits. It was the teapot in the set that won me over. The cutters are sturdy and well made, which is just as well as they retail at nearly £11. The shapes and colours are fun, suggesting a tea party, with cake slice, cupcake (that’s the round one apparently) and teapot. The resulting biscuits are quite large though, so not for the faint hearted. I rather feel that my decorating skills might be put to the test at some point. I was making some chocolate shortbread to line a couple of tart cases so thought I’d make some extra dough in order to try out one of my new cutters. However, I was feeling in a loving mood the day I made it, so it was the hearts I used rather than the teapot. The recipe for these will follow along with the tarts, but suffice it to say, the hearts were tasty and kept well. They look delicious, looking forward to seeing the recipe! Looking forward to that recipe. These are cute; and I love the teapot shaped cutter as well. Can’t wait to see what you make with the teapot cutter! ooh how cute! Not sure I’ve had chocolate shortbread before but I’d really like one of yours 🙂 Looking forward to the recipe and what you get up to with the rest of the cookies cutters. I’m sure biscuits taste better when they are heart shaped. I love the teapot cutter, I want one! I have a set of dinosaur cutters, they’re my favourites. The chocolate heart shortbread’s are adorable. Gloria – thank you and thanks also for your well wishes. We had a lovely Saturday and went for a lovely coastal walk. C – thank you. I’ve got all out of kilter with my posts. am now not sure which one to post next. Dom – ha ha, what are you doing to your cutters to make them fall apart? Getting rather worried about what I’ll do with the teapot, sort of feel it would need something special – getting very worried now. Angela – thank you. The teapot seems to be a general favourite. Baking Addict – I’d never had it before I started making it, but it’s well worth trying. Aveen – dinosaurs sound a bit more scary than a teapot. Celia – thank you, they were. 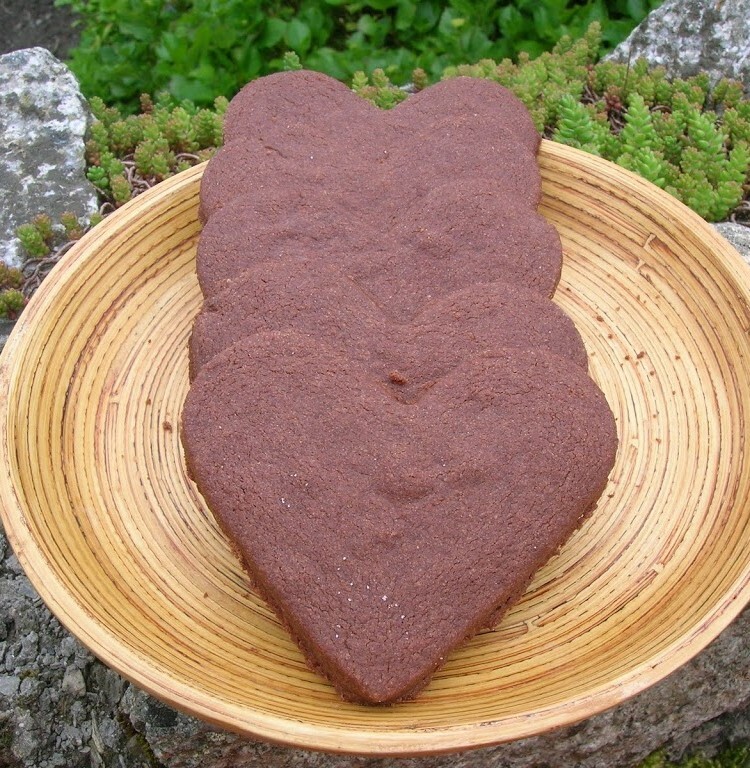 Love shortbread – never tried chocolate shortbread though! I like bigger biscuit cutters because it takes less time to make the biscuits. Is one of them a genie’s lamp or is it a teapot? Quite cute. Hi Maya – It’s meant to be a teapot and although I really like it, I think I’ve only used it once – just too many things to try. very cute. Not sure about the teapot cutter though. Could be the angle of the photo though. I definitely like them all. I have a whole collection of shapes but not of a teapot or cake slice.